Body composition is one of the key components of fitness. Maintaining a healthy body composition is important for overall fitness, but for athletes, it can make the difference between peak and subpar performance. Body composition varies among athletes as the ideal ideal body fat percentage depends on the demands of your sport. What is the ideal body composition for obstacle athletes? For this relatively new sport, no clear precedent has been made for a healthy body fat percentage. However, we can determine a suitable range based on recommendations for general fitness and related activities such as running and triathlons. For general fitness, the American Council on Exercise (ACE) recommends a body fat percentage ranging from 21-24% for women and 14-17% for men. ACE’s guidelines for athletes range between 14-20% for women and 6-13% for men. Based on ACE’s guidelines alone, a healthy body fat percentage for obstacle racing may range between 14-24% for women and 6-17% for men, depending on the commitment level of the athlete. If you take on several races each year, your ideal body fat percentage will likely be in the lower end of the range, while the body composition for casual athletes may be in the higher end of the range. Since running is one of the staples of obstacle race training, it’s also helpful to consider running in order to determine an appropriate body composition for obstacle athletes. In order to maintain pace and speed, a lower weight and body fat percentage is typically recommended for competitive runners. Recreational runners may be comfortable and healthy with a body fat suggested for general fitness. To peak for competition, long distance runners (12+ miles) may drop down to as much as 10-12% body fat for women and 5-7% body fat for men. Female athletes focused on shorter distances may maintain a body fat of 11-14%, while male short-distance runners may sustain a composition of 6-8% body fat. Even though a lower body fat is typical for long distance running, athletes would be wise to keep in mind the importance of sustaining essential fat (10-13% for women; 2-4% for men) for overall health and maintenance. Although running is a staple in obstacle racing, the demands for obstacle racing go beyond a traditional run. Like triathletes, obstacle athletes need to be proficient in more than simply running. Although these two disciplines differ greatly, each activity is interdisciplinary, requiring more than just running fitness and endurance. Just as a triathlete needs to master the disciplines of cycling and swimming, obstacle athletes need to hone obstacle-specific competencies such as lifting, pulling body weight (monkey bars), balancing over unsteady terrain, jumping, landing, crawling, and more. Similarly, the ideal body composition for triathletes and obstacle athletes varies depending on the duration of the event. For sprint triathlons, cutting down on body fat and maintaining a lower body weight is helpful in order to sustain your goal pace. This may also apply to shorter obstacle races. Multiple time Spartan Race winner Hobie Call has a slim, lean, and fit frame. 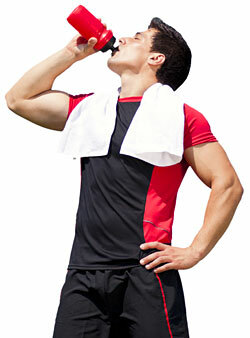 Based on Call’s example, cutting down on mass and body fat can boost obstacle racing performance. On the other hand, for a long triathlon event such as an Ironman, too little body fat may actually hinder your body’s ability to meet the demands for a long event. In order to survive an ultra-endurance event, some additional fat and mass may actually be critical. Is the case for longer, mega obstacle runs? Based on the winners of recent longer obstacle runs, the ideal body composition varies. Also, in obstacle racing, longer runs vary in duration, from the marathon-length Spartan Ultra Beast to the 48-hour Death Race challenge. Joe Decker, a muscular, husky athlete, won back-to-back Spartan Death Races. In contrast, the winner and runner-up to the 2012 Spartan Ultra Beast, Cody Moat and Junyong Pak, have lean, sinewy body types. Overall, the ideal body composition will vary among obstacle athletes, as shown by the sports’ successful racers. Beginner and casual athletes may be comfortable with a body composition recommended for general fitness needs, while serious racers may strive to maintain a lower body fat in efforts to maintain speed and optimize performance. Monitor your body composition regularly, log how you feel at specific body fat percentages, and see what’s best for you. If in doubt, be reasonable and aim for general fitness recommendations.